One of the first events for the Shubbak Festival, and the opening event for the festival’s music programme at the Barbican, sees the enchanting Karima Skalli take to the stage with a selection of sensational, spiritual songs accompanied by the talented Asil Ensemble. 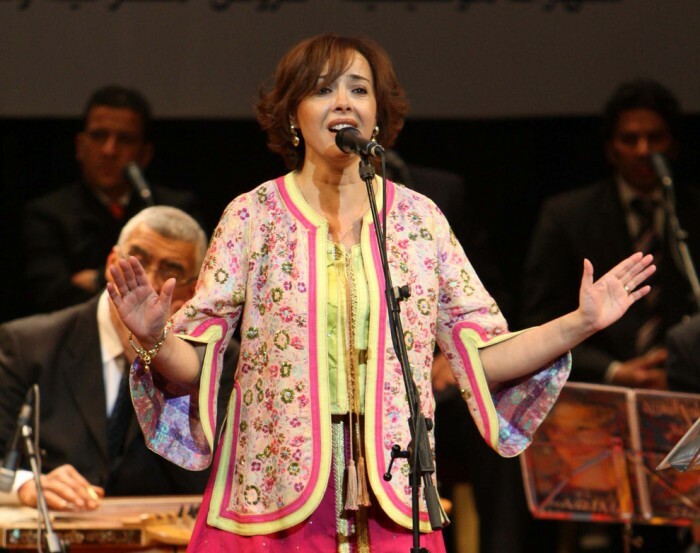 Internationally renowned singer Karima has been singing classical Arab music, particularly maqamat and Sufi chants, since the age of nine back in her hometown of Fez, Morocco. Now the critically acclaimed singer travels all over the world to share her beautiful, traditional music and will be making her UK debut at the Shubbak Festival. Karima will be singing three burdas – song cycles that combine poetry and music – that demonstrate the poetic and musical mastery of the Arab tradition through the ages from the 12th century poetics of Al Busari; the genius arrangements of Umm Kulthoum and the new compostition by oud virtuoso Mustafa Said set to words by contemporary Palestinian poet Tamim Barghouti. The Shubbak Festival blog caught up with Karima before her journey to London to ask her a few questions about her upcoming performance. In her interview, Karima’s impassioned words highlighted her love for her musical craft as she emphasised the universal power of music as a source of healing and reconciliation across linguistic, religious and national borders. Aimee Dawson: Your performance ‘Burda’ will be opening the Shubbak music programme at the Barbican. In general, religious Arabic music is even more popular in the West than in the Middle East – what is it about your music that draws a worldwide crowd, even for those who do not understand Arabic? Karima Skalli: First of all, it is a great honour for me to celebrate the opening of the Shubbak Festival with this beautiful work, ‘Burda’, and especially to perform in the prestigious Barbican Centre. As an interpreter of mystical and Sufi chants, I can tell you that the world needs healing and this language simply comes straight from the soul and the heart. A voice, an instrument, a word or a gesture with that universal love can participate in a reconciliation with oneself. The sincerity of the interpreter weaves that communion. AD: Your performances are renowned for their overwhelming resonance and spirituality. For Shubbak, you will be performing on Saturday 11 July – during the holy month of Ramadan. Do you feel differently when you perform at such a spiritual time? KS: It is of course an event that touches my heart and it is a joy to share this with the great British people during the sacred month of Ramadan. We will be singing for peace and love among all people. AD: You will be performing a new piece to accompany a well known classical burda with words from the 12th century poems of Al Busari and the famous Nahj El Burda of Umm Kulthoum. The new composition is by Mustafa Said and is set to words by contemporary Palestinian poet Tamim Barghouti. Can you tell us a little bit about the new piece? KS: The burda of Al Busari is a celebration of one of the most beautiful poems written in the adoration and love for the prophet Mohammed throughout history. For the burda we will perform some verses from each chapter. It is sung in an ancient, simple and pure tone, a cappella, which is the traditional way of the Zawaya culture of Morocco. Nahj El Burda, which is by Ahmed Shawqi and with music from Riad Sunbati, is one of the famous songs of Umm Kulthoum that I have the pleasure of performing with the Asil Ensemble. The new piece is a composition by the fabulously talented Mustafa Said and is set to the words of poet Tamim Barghouti, whose poems are well known for their fluidity. This beautiful literary and musical creation is attached to an authenticity and depth of history as well as the spiritual light that the piece conveys, with some beautiful musical variations that the audience will discover…! AD: As you say, you will be accompanied by the incredibly talented Asil Ensemble. How have you found working with these musicians? KS: The whole ensemble is composed of very bright and talented young soloists who have skills in research and a taste for quality. They also bring new creation without loosing the authenticity. Our collaboration is in a great atmosphere with lots of love. AD: Have you had a chance to look at any of the other events at the Shubbak Festival this year? Could you pick a favourite? KS: I congratulate the Shubbak Festival for its vision and the diversity of Arab culture on show and if it weren’t for the fact that I’m returning to Morocco the day after our concert, I would go to all of the performances! Karima Skalli’s performance, ‘Burda’ will take place on Saturday 11 July 2015 at 7pm at the Barbican Concert Hall, with pre- and post-performance events available. Aimee Dawson is this year’s Shubbak Festival writer-in-residence. She is a London-based writer and blogger on contemporary art from the Middle East and North Africa and the Editorial Assistant at Ibraaz.org.